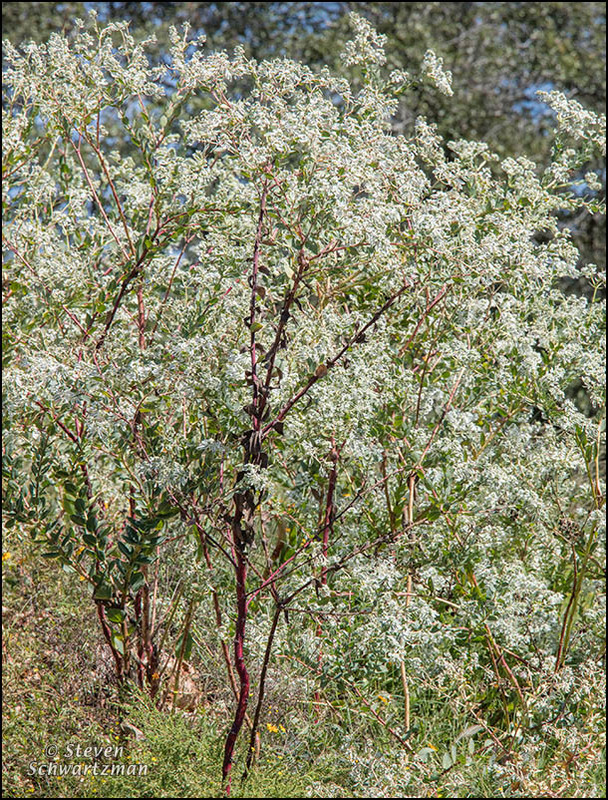 At the risk of snowing you under, here for the third post in a row is a view of snow-on-the-mountain, Euphorbia marginata. Again from September 29th along TX 46 in Comal County, this view emphasizes the chaos of details when plants farther back are seen through the spaces in the closer plants. Notice also the complementary red in all those stalks. The new life is a sycamore tree, Platanus occidentalis. Presumably the fallen trunk, which gleamed bright in the sunlight, is also from a sycamore, but I don’t know that for sure. 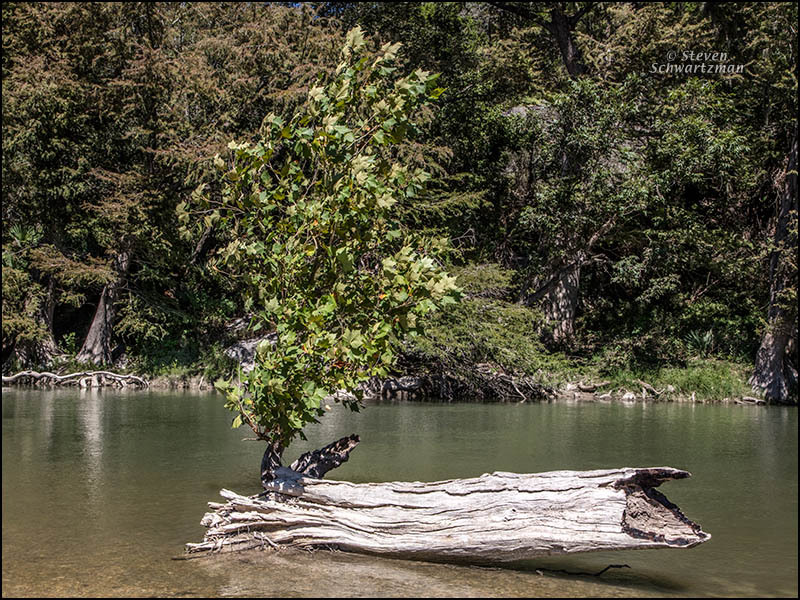 What I do know is that the scene is from Guadalupe River State Park on September 29. 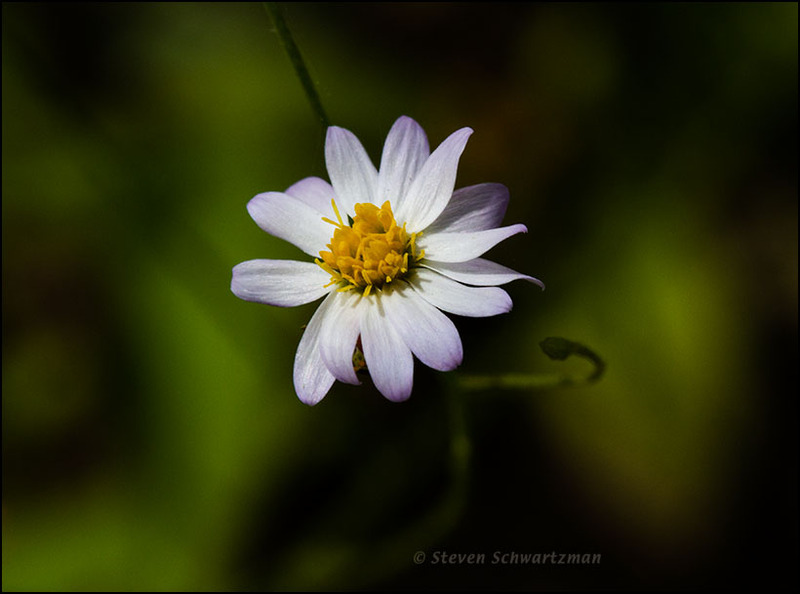 At Guadalupe River State Park on September 29th I found a cowpen daisy plant (Verbesina encelioides) that was flowering. Dig those dark shadows. Only once before has Verbesina encelioides appeared in these pages. Does the genus name sound familiar? Perhaps it’s because frostweed is also in that genus. 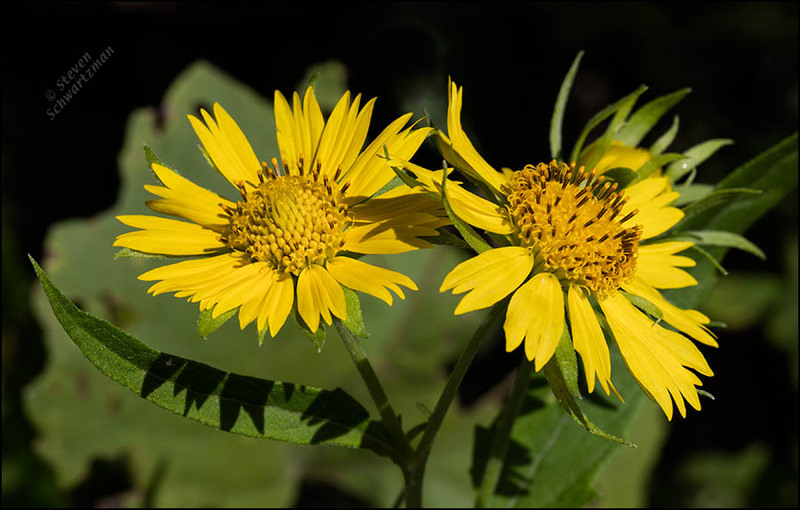 As attractive as the flower heads of the cowpen daisy are, the plant has an unpleasant odor. Along State Park Road P31 south of Guadalupe River State Park on September 29th I stopped to photograph some Maximilian sunflowers (Helianthus maximiliani). The only way I could line up any of the tall plants against the array of feathery clouds overhead was to face toward the sun. Even with a lens hood on my wide-angle lens I had to hold one hand out in front of and above that lens to block the sun that was just above the frame in order to eliminate flare and polygons inside the frame. It was hit and miss, what with my left hand involuntarily moving as I held the camera in my right hand while the plant swayed back and forth in the breeze, so I took a bunch of pictures in the hope that at least a few would work well. The one shown here seems pretty good. About two miles south of the waterfall you saw last time, Edge Falls Rd. 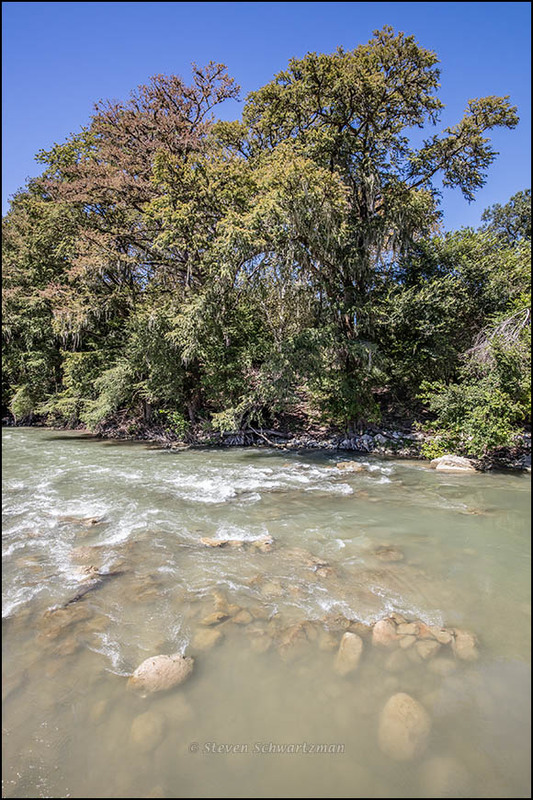 crosses the Guadalupe River. Because the horizontal picture above doesn’t show you the tops of the nearest bald cypress trees, I’ve added a vertical picture that does. Even though the photographs were taken from different positions and at different angles, you can still match up some of the stones in the river. I hadn’t done much photographing in Kendall County until I made a 230-mile circuit through the Texas Hill Country on September 29. 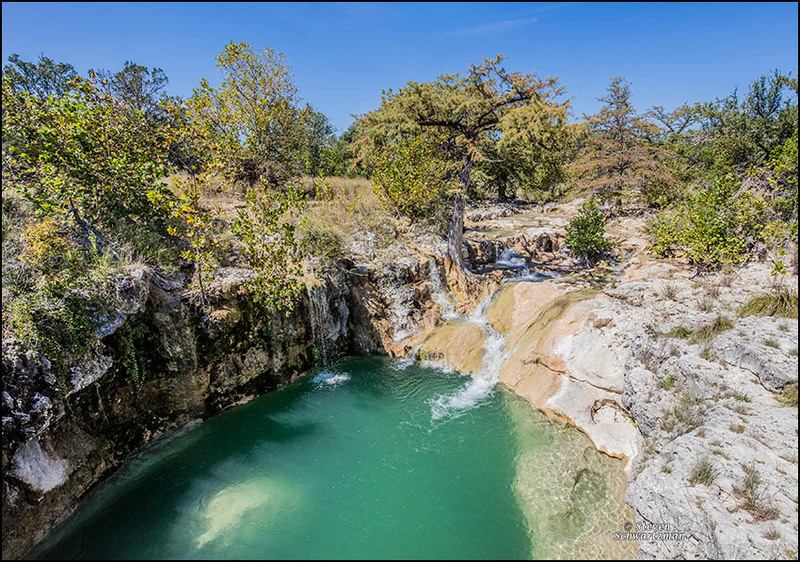 My goal was a waterfall that another Austin photographer had made me aware of. 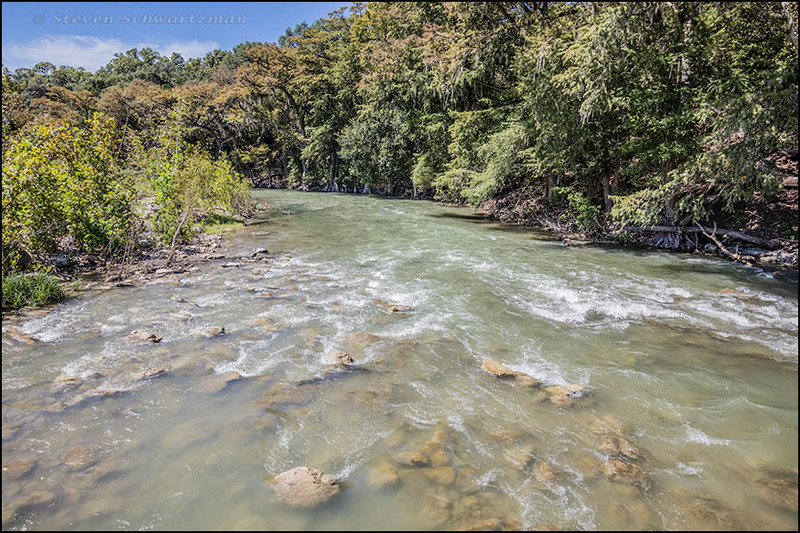 I found it a few miles south of Kendalia, where Edge Falls Road crosses Curry Creek. The actual Edge Falls, which I’ve read is larger, lies upstream but isn’t open to the public. Neither is what you see here; all I could do was look (and photograph, of course) from the little bridge that carries the road over the creek. Here’s a native plant you’ve not seen in these pages till now: Chaetopappa bellidifolia, apparently known as dwarf white aster and white-ray least daisy. I say apparently because I’ve never heard anyone mention these tiny members of the sunflower family. They’re so small that the rays on each daisy are only 2 to 3 millimeters long. 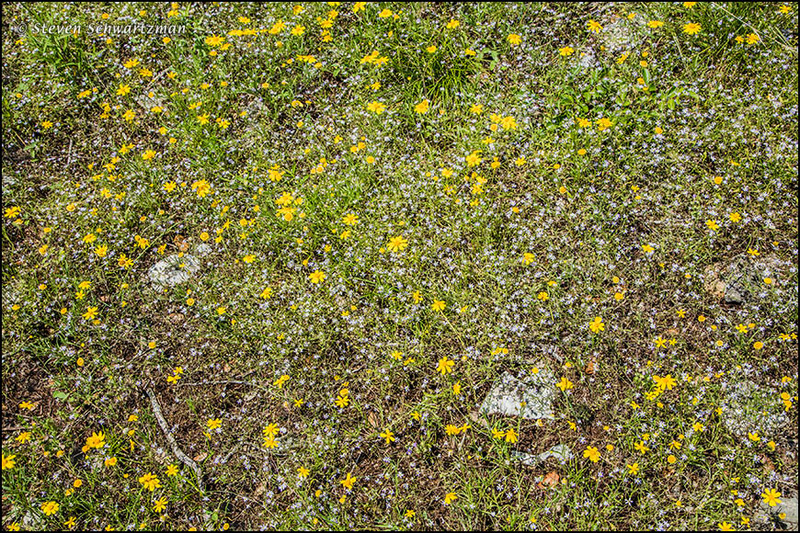 The yellow four-nerve daisies (Tetraneuris linearifolia) in their midst, already on the smallish side, look large by comparison. As you can see, here at least the least daisies make up for their diminutive size with their large numbers. This photograph is from along Yaupon Dr. in my Great Hills neighborhood in Austin on May 11. The rocky ground is typical of the Texas Hill Country. If that stars-in-the-sky view of least daisies left you with at least some desire to see an individual Chaetopappa flower head, here’s one I photographed in Bastrop County on April 12, 2010. Note: I’m away from home and will be for some time. Please understand if I’m late replying to your comments.